What’s the difference between Swiss and Baby Swiss? Why does Muenster have an amber rind? What cheese is best for melting? At some point, questions like these have probably crossed your mind. Perhaps while perusing the deli case at a grocery store or making a cheese-laden meal at home. Well, wonder no more. We’re here to give you the 411 in our Cheese 101. Learn more about how we age, season and tuck our handmade cheeses (produced gluten-free and with no added MSG) into recipes. First things first. Let’s take a quick look at how cheese is made. First, beneficial cultures and enzymes are added to milk. That prompts the milk to coagulate, separating the liquid (whey) from semi-solid curds. Then the curds are cooked, seasoned, shaped and prepared for aging. The aging process can take anywhere from weeks to years, depending on the desired flavor and texture. Generally, the longer a cheese is aged, the stronger the flavor will be and the firmer the texture will be. Now that you know the basics, let’s get into the specifics. This famously hole-y cheese is named after its country of origin: Switzerland. Historians believe this nutty, sweet cheese was first produced as early as the 1300s, but didn’t become popular in surrounding countries until the 1800s. The aging process is what gives Swiss its memorable flavor and shape. The longer the cheese is aged, the larger the holes and the stronger the flavor. This is why our baby Swiss has smaller eyes and a milder flavor than our aged Swiss. So depending on your flavor preferences and the dish you’re making, either could be a good choice. 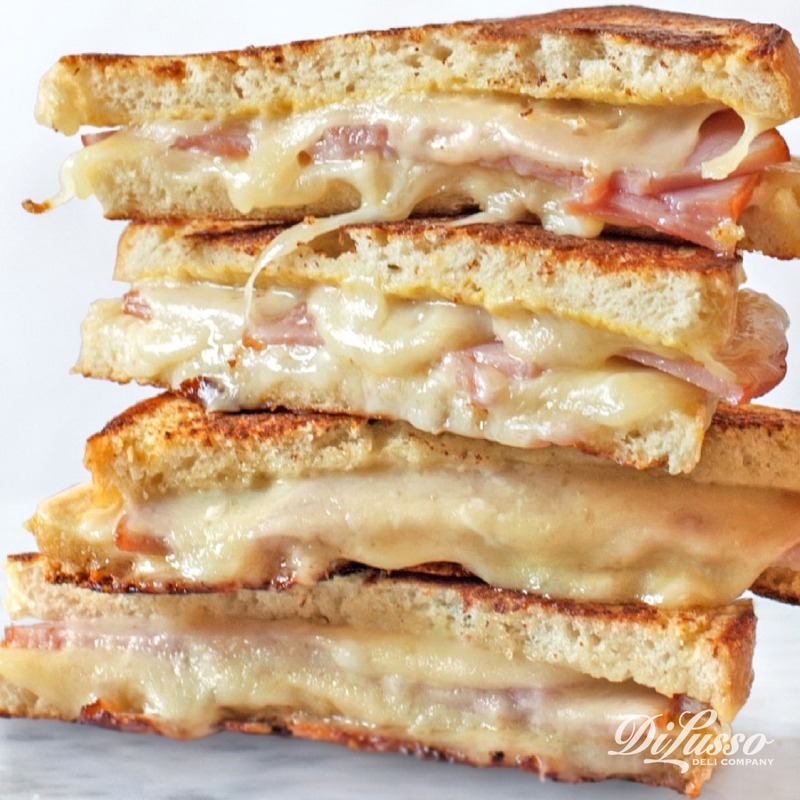 Both taste great on the classic Croque Monsieur that’s also layered with our honey roasted ham, dijon mustard and mayonnaise. An Italian creation, mozzarella also has a Neapolitan name. “Mozza” means to cut, which refers to how the cheese is cut into smaller pieces (often spherical) before the aging process begins. 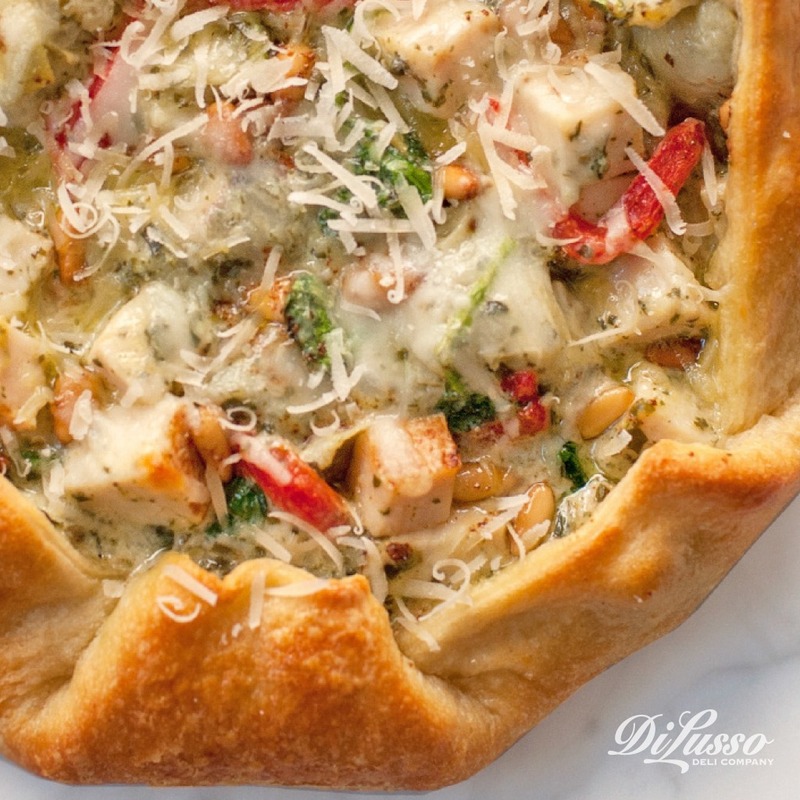 We make our mozzarella according to classic traditions, using whole milk to get a mild, delicate flavor that tastes particularly delicious with the flavors of this Pesto Chicken Artichoke Galette that’s laced with roasted red pepper strips and topped with toasted pine nuts. With a flaky crust and doughy underside, this galette is a cross between a pizza and a savory pastry. Legend has it that muenster was originally created at an abbey of Munster in the Alsace region of France during the 7th century. It’s typically aged for a shorter period of time, making it a younger, milder tasting cheese. One of Muenster’s most recognizable characteristics is its amber edging. That color comes from annatto, a sweet and nutty seasoning that also gives Muenster some of its flavor. Our muenster is soft and smooth, making it easy to melt in recipes like grilled cheese or mac and cheese. It’s also a favorite on charcuterie boards because of its colorful edging. The first written mention of Gouda dates back to the 1100s, making it one of the oldest recorded cheeses in the world. This yellow Dutch cheese has stood the test of time thanks to its natural buttery sweetness and its ability to take on other flavors. For example, smoked gouda is often roasted over wood chips to give it that sought-after smoldering taste. The smoking process is also what gives our Smoked Gouda its amber rind. 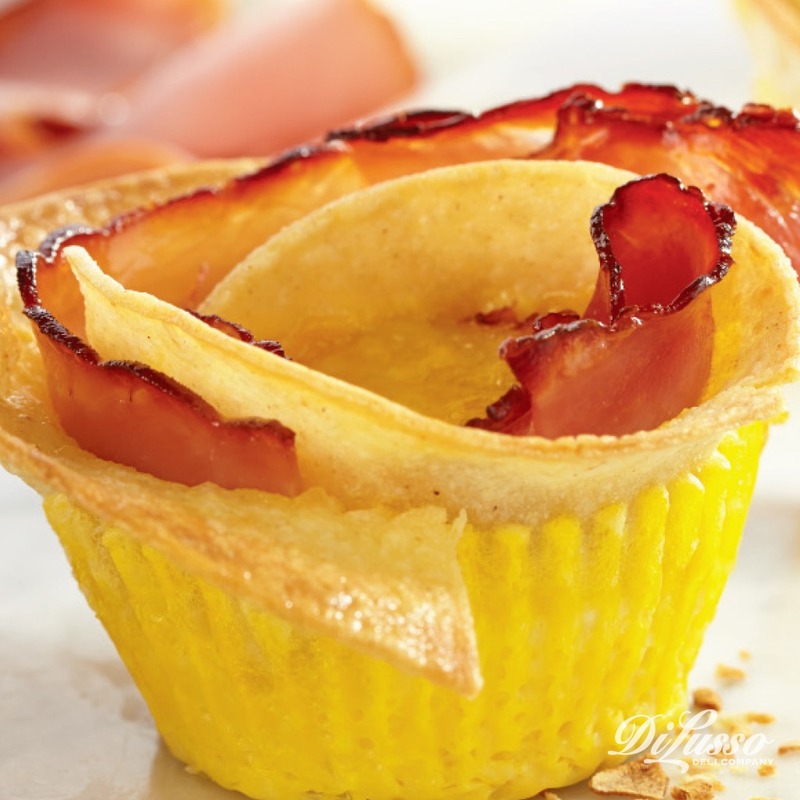 It’s the perfect complement to our black forest ham in these Savory Breakfast Cups. They might just make getting up in the morning a little easier. For this one, we’ll need to take a trip back to the mid 1800s. Inspired by the art of cheese making, Danish farmer Hanne Nielson traveled Europe to learn the tricks of the trade. After returning to her farm, she used her newfound knowledge to craft the creamy, buttery Havarti we know and love. She named her creation after her farm, Havarthigaard. Classic varieties, like our Havarti, are younger and are typically aged for just a few months. We put a tasty twist on our classic Havarti by adding seasonings like oregano, basil and parsley. The result: our Havarti herb cheese. It has all the creamy, buttery-ness you expect from Havarti with the piquant taste of Italian herbs. Because of its characteristic creaminess, Havarti is great for melting in grilled cheese sandwiches like our Grilled Ham & Havarti Sandwich. 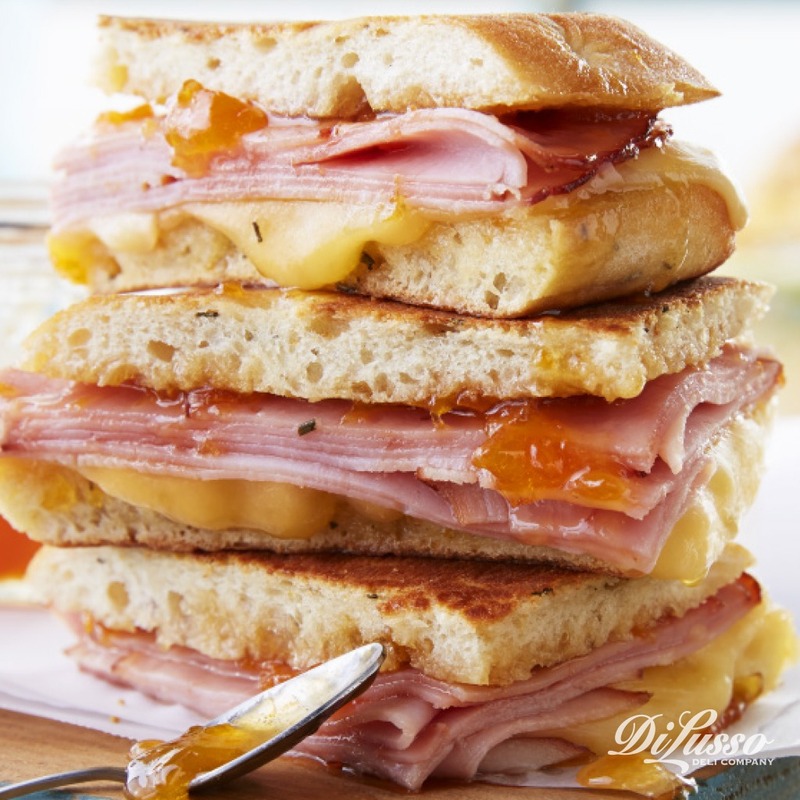 Sweet apricot jam and honey contrast nicely with our savory Havarti, smoked ham and rosemary focaccia. 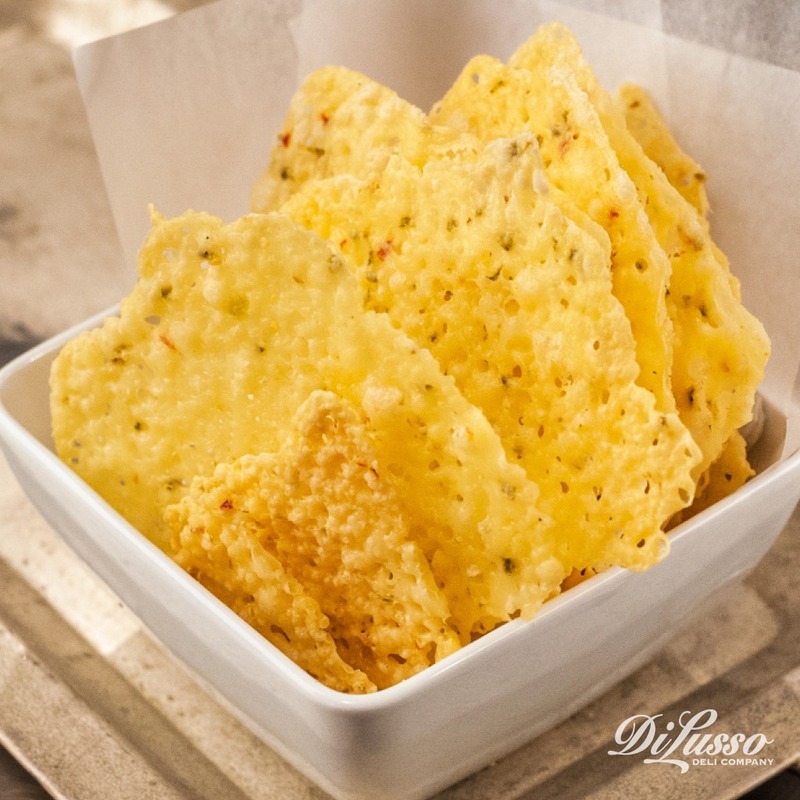 Both varieties taste great when baked into these Deli Cheese Crisps. They retain their own one-of- a-kind flavors while transforming into light, snappy crisp that can be placed on everything from sandwiches to soups to salads. One of the most popular cheeses in the U.S., this golden delight originated in the British village of Cheddar. It was initially aged in many of the village’s caves because they were the perfect temperature and humidity for cheese making. Cheddar’s “sharpness” is dictated by how long it is aged. The longer Cheddar is aged, the “sharper” or stronger the flavor. Medium (also known as Mild) Cheddar is typically aged for 2-3 months while extra sharp can be aged for more than a year. Sharp is somewhere in the middle, anywhere from 6 months to a year. Our medium cheddar is aged on the lower end of that scale, resulting in a mild flavor and creamy texture. 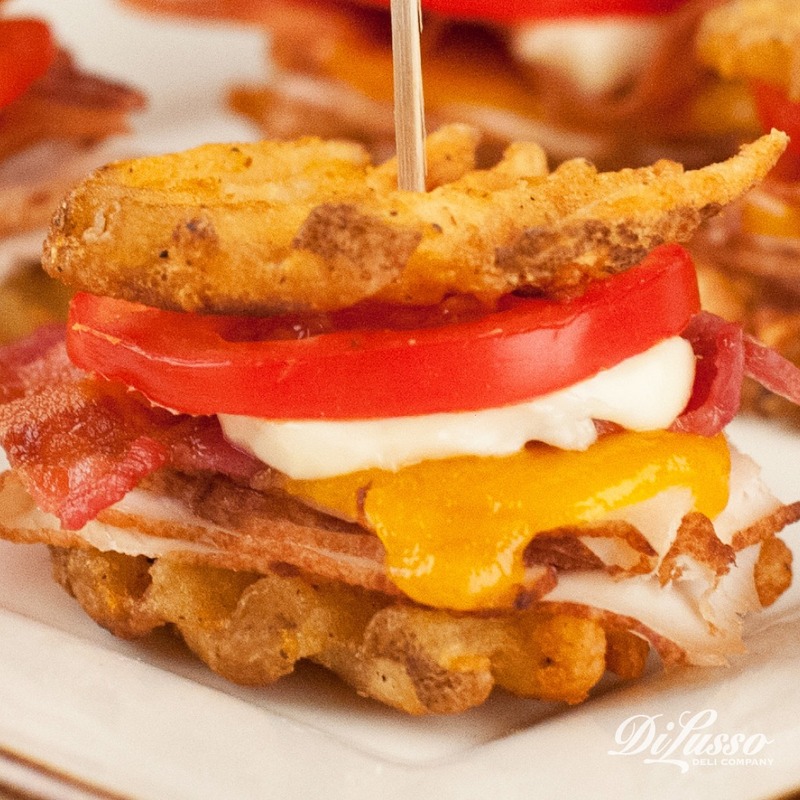 It pairs nicely with the salty bacon and fresh tomatoes on these Waffle Sandwich Sliders. On the other hand, our Wisconsin Sharp Cheddar has a tangier flavor and firmer texture that tastes great on these Roast Beef Hash Brown Sandwiches that are layered with sautéed onions and our horseradish dijon aioli. You can thank Joseph F. Steinward for this one. In 1885, this savvy Wisconsin cheesemaker started altering the way he made Cheddar cheese by washing the curds with cold water instead of warm water. This gave the cheese a milder flavor and creamier texture. Steinward named his masterpiece after the nearby town of Colby, WI. Because of its mellow flavor and smooth texture, our colby is great for melting into recipes like soups, dips and even fondue. 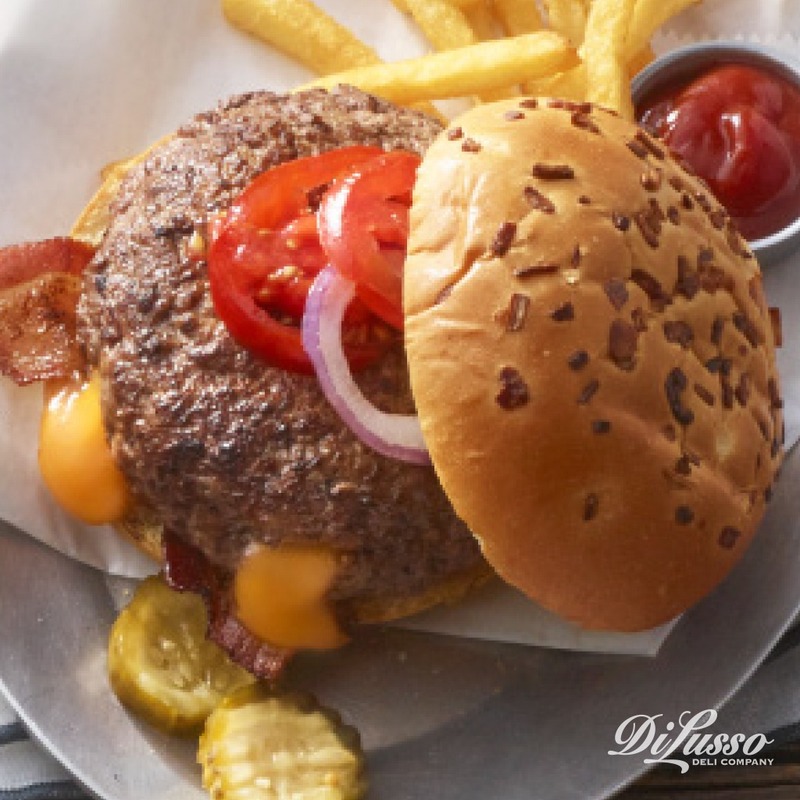 It melts especially well when folded into ground beef and grilled to perfection, creating a delectable pocket of molten cheese in this Juicy Lucy Burger. Colby really knows how to put the cheese in cheeseburger. When it comes to “Jack” cheeses, Monterey Jack is always the common denominator. White, velvety Monterey Jack provides a nice flavor base that complements a variety of other cheeses and seasonings. Colby is one such cheese. When blended, Colby and Monterey Jack turn into the marbled masterpiece known as Colby Jack. This one is often used in southwestern dishes like tacos and enchiladas. 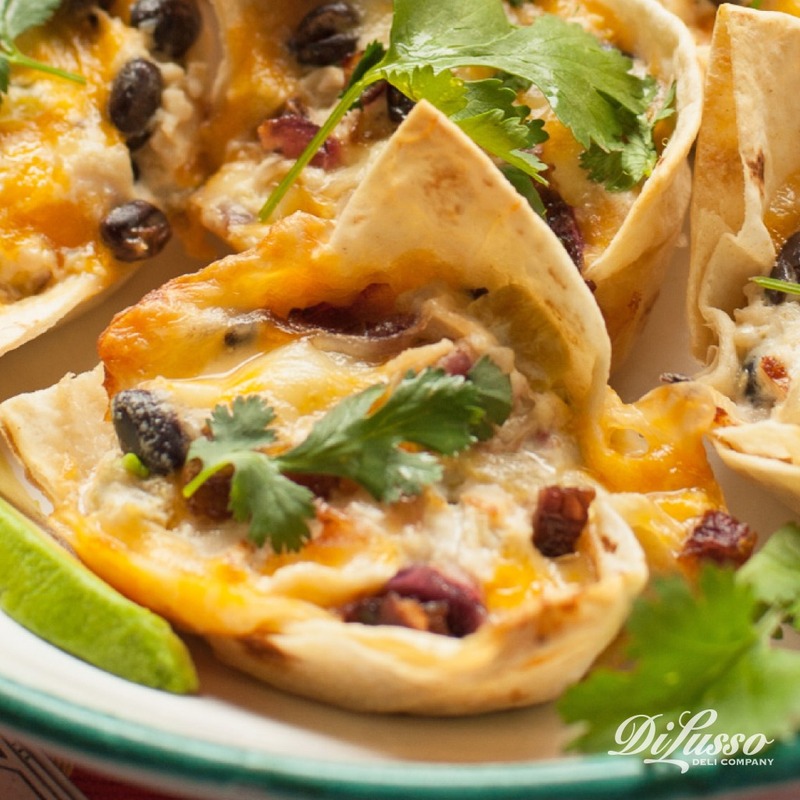 We used our colby jack alongside black beans, green chiles, fresh lime and avocado in these Green Chile Chicken Bites. It’s also common to blend mild Monterey Jack with ingredients that crank up the heat. We did just that with our pepper jack and habañero jack cheeses. Our Pepper Jack is dappled with jalapeños and is a touch milder compared to our Habanero Jack, which is flecked with real habanero peppers. Depending on how hot you like it, either cheese would add a nice kick to salt-rimmed Bloody Mary Cocktails or cilantro-infused Turkey Tortilla Crunch Wraps. This firm, ivory cheese has its roots in southern Italy. Its name is derived from the Neapolitan dialect of southern Italy. The words “prova” and “provola” mean “globe-shaped,” which refer to the unique shape Provolone is formed into before the aging process. 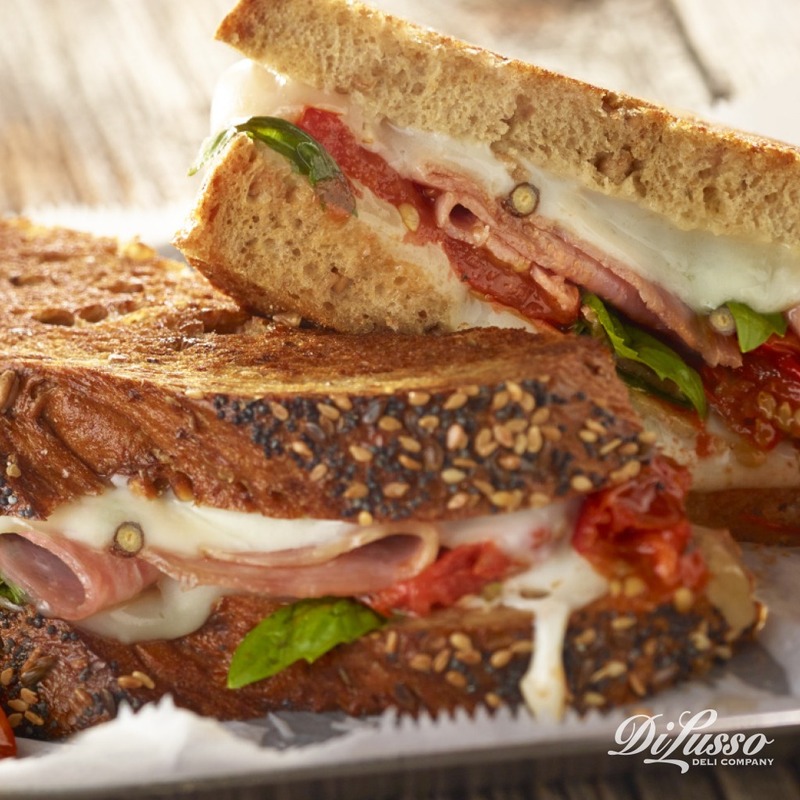 Our provolone is aged for six months, giving it a bold, sharp taste and authentic flavor that complements other Italian favorites like our sopressata in this Italian Grilled Cheese. Fresh basil, roasted tomatoes and marinara sauce layer on even more flavor. 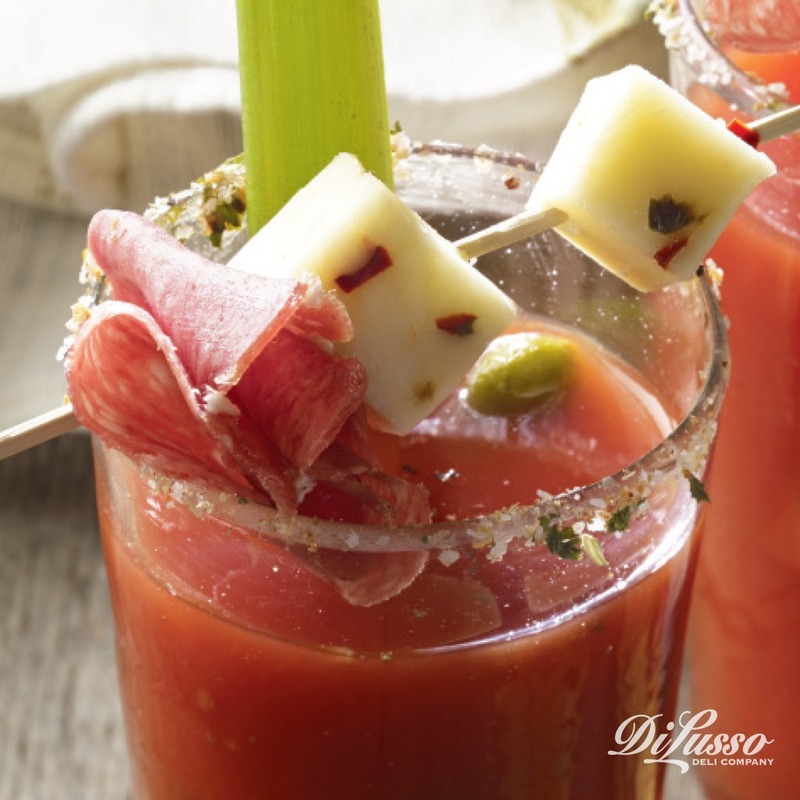 While each of our cheeses tastes great when flying solo, they’re also delicious when combined. 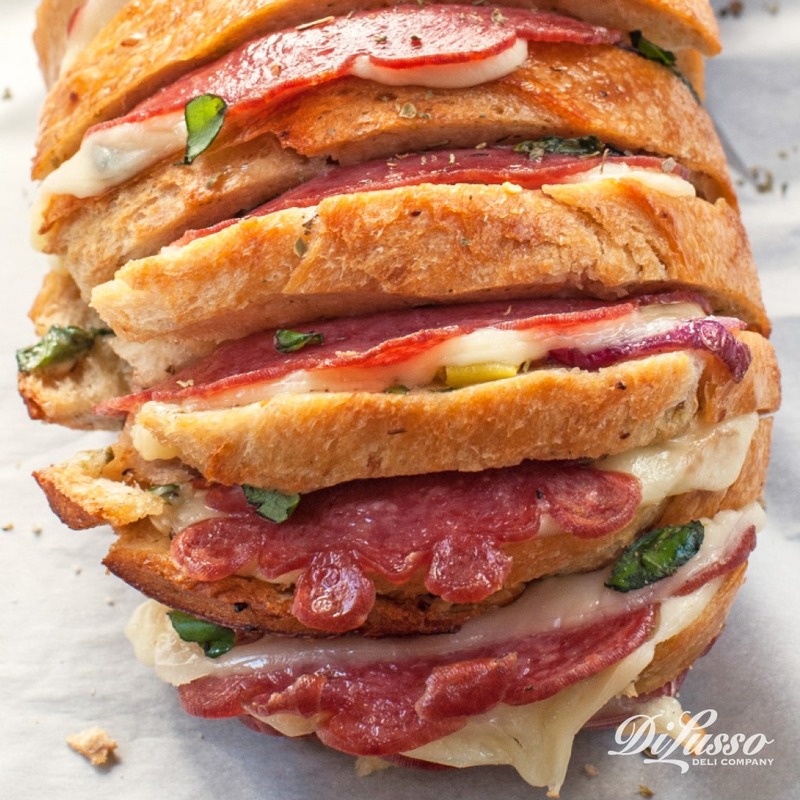 They can create anything from the ultimate grilled cheese - like the Tre Formaggio Sandwich - to this deliciously shareable appetizer called Stuffed Italian Bread. However you slice it (or grate it, or shred it), the results are delicious. For even more cheesy recipe inspiration, you’ll want to browse through the cheese recipes on our website. To see all our cheeses in one place, check out our product page.